The spectacular rise of mobile robotics software market has of late become a buzzing subject, with the extensive proliferation of automation in e-commerce and logistics application. The procedures with regard to logistics operation and inventory control have undergone a massive transformation over the recent years with mobile robotics standing as a major trend shaping the business landscape. The latest buzz grabbing all the light is the introduction of a fully automated mobile robot named The Swift brought forth by IAM Robotics, one of the leading giants in mobile robotics software market. As claimed by the manufacturers, this robot offers a complete solution to all kind of warehouse logistic operations owing to its strong portfolio that include IAM flash, SwiftLink fleet management software, and a 3D item scanner. If experts are to be believed, this product is profoundly a breakthrough in the entire mobile robotics software industry space, given the fact that it can be integrated seamlessly into any warehouse operations without any changes in infrastructure. The escalating demand for efficient and swift delivery in e-commerce and online retail space has prompted robust advancements in autonomous drones and vehicles. 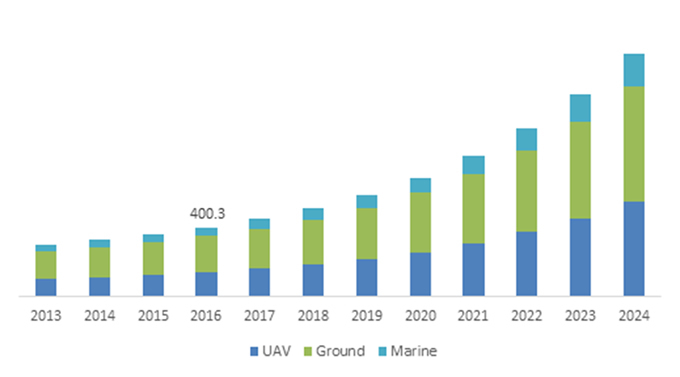 In fact, Global Market Insights, Inc., forecasts that unmanned aerial vehicles market will witness a lucrative growth of 19% CAGR over 2016-2023. 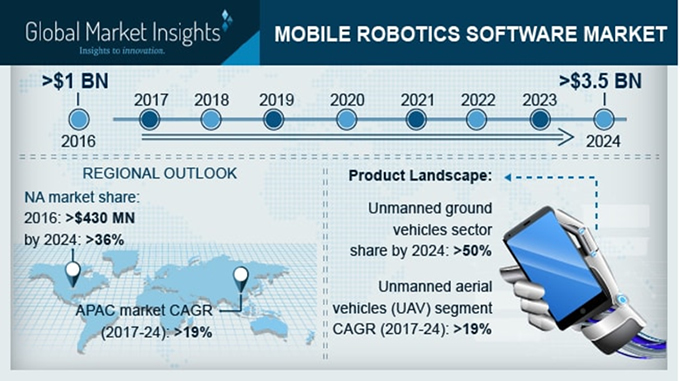 It is therefore, no surprise, that the growth of unmanned aerial vehicles market will leave a direct impact on mobile robotics software market share in the coming years. In this regard, it is prudent to note that e-commerce giants like Amazon’s and Walmart’s effort for bringing floating warehouses into their business have certainly pushed the overall mobile robotics software market outlook, given the fact that these floating warehouses is claimed to operate both by human intervention and autonomously. In addition to this, the American government support with regards to UAV implementation for civilian purposes has further propelled the regional mobile robotics software industry size. Speaking along similar lines, with U.S. at the foray, North America mobile robotics software market is forecast to represent a significant portion of the overall industry, having contributed a lucrative revenue of USD 430 million in 2016. U.S. being one the strongest technology affluent nations, is anticipated to integrate robots in domestic arena even over the coming years, which by extension will impel the regional mobile robotics software market size. As per estimates, North America, down the line of seven years will prove to be a strong participant in global mobile robotics software industry, with an estimated market coverage of 36% of the overall revenue by 2024. The competitive profiling of mobile robotics software market is rather consolidated with leading giants covering almost 50% of the overall business space. Some of the prominent names include Omron Adept Technologies, Inc., Brain Corp., Universal Robots, and iRobot Corporation. These participants are readily adopting mergers & acquisitions as a major growth strategy to sustain the competition. One such recent instance is the collaboration of Fetch robotics and renowned Robotics technology integrator & distributor, ONExia. With this alliance, both the giants collectively are reported to bring software hardware solutions and logistics expertise in Mid Atlantic belt. Sum and substance, growing investments in mobile warehouse robotics by renowned biggies is certain to provide a significant impetus to mobile robotics software industry size in the coming years, which is projected to exceed a valuation of USD 3.5 billion by 2024.